Ukazuje piękno przemiany Ciela... w potwora. They each kinda represent who he is, and you showed them off wonderfully. Is that Ciel as a Homestuck troll? He´s look that so evil! The world is cruel~ Why can't he be real??? It's so hard for me to chose a favorite. Umm... umm... umm... the 4th one? No... umm... so hard... umm... You know what? I'm choosing all of them. Yeah. So much easier . i could just eat him! This is so good you dont even know! Im going go and pick up my brain off the floor because you just blew my mind! Is it just me, or is that Kaito all the way to the left? This is an incredibly awesome picture! 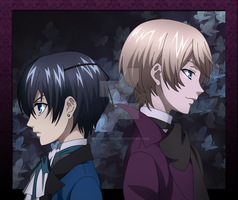 When being crazy from being Alois' puppet: two souls in one is indeed indescribable! The many personalities of Ciel Phantomhive. Because he's simply one hell of an earl. Very impressing picture. O_O Very very impressing. 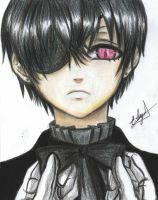 OMG CIEL SO HOT CUTE ADORABLE *faints* I ....LOVE HIM SO MUCH!!!!!!!!! this is incredible; I love it; Ceil is MY FAVORITE!!! !